in the mixing bowl, and pour over it the scalded milk. Stir to thoroughly mix and then cool to 80 degrees Fahrenheit. Now dissolve one-half yeast cake in one-half cupful of water 80 degrees Fahrenheit, and when the milk is at the proper temperature, add six cupfuls of flour and work to a smooth dough. Place in a well-greased bowl, turning the dough around in the bowl so that it will be thoroughly coated with shortening. Cover and let rise three and one-half hours. Now pull the sides of the dough into the centre and punch down, turning the dough over. Let rise again for one hour, then turn on a moulding board and divide the dough in half. Knead each piece into a ball. Cover and let rise or spring for ten minutes. Now roll out one-quarter inch thick, using a rolling pin. Brush with melted shortening and sprinkle well with brown sugar, using about one cupful. Now dust with two teaspoonfuls of cinnamon and spread over the prepared dough one and one-half cupfuls of currants or small seedless raisins. Begin at the edge and roll like a jelly-roll. Cut in pieces one and one-half inches thick and then place in prepared pans and let rise for one hour. Then bake in a moderate oven for forty minutes. Grease the pan very thickly with shortening and then spread one cupful brown sugar and one-half cupful of currants or small seedless raisins evenly over the bottom of the pan. Place buns in pan and let rise for one hour in a warm place, then bake in a moderate oven for thirty-five minutes. in a saucepan, mix thoroughly, and then bring to a boil. 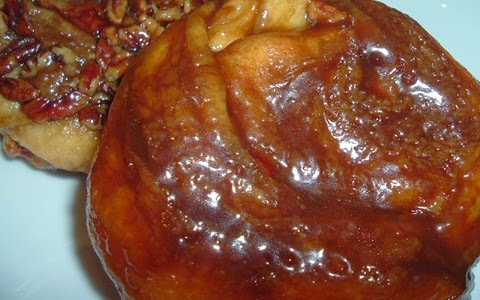 Now, just as soon as the buns are baked, turn from the pan at once and brush well with the prepared syrup, brushing the bottom with the syrup, as brushing the candied part of the buns prevents it from hardening. Let cool and then use.